At its best, American medical care is a sublime blend of science and humanity, a system where doctors routinely transplant the human heart, replace defective joints, and excise tumors from the mid-brain. Every day in the United States, families are made whole again by some of the most complex surgical, medical, and pharmaceutical therapies ever devised, interventions from gifted physicians and researchers devoting their lives to alleviating human suffering. When political leaders declare, as many often do, that the United States has “the finest healthcare system in the world,” it is this exalted aspect of American medicine to which they refer. So the notion that the United States might learn valuable lessons from care delivery in other nations—particularly poor countries—is instinctively counterintuitive to the pervasive belief that we have the finest health care on the planet. Unfortunately, other aspects of American health care—low quality and high cost, as well as substantial health disparities—are considerably less uplifting. Such shortcomings leave the United States ranking at the bottom among the most advanced nations in comparisons of the quality and efficiency of care, even as the domestic cost of care (about $9,000 per capita), is double that of peer nations. A good place to begin is by redefining what healthcare and public-health professionals in the United States now call “global health”: improving conditions particularly in poorer parts of the world, often by exporting expertise and resources from better-off areas like the United States and Europe. Equity is the soul of global health. In the United States, access to care—especially the very best care—is frequently correlated with ability to pay. Global health turns the focus from complex medical procedures and high-technology practice at the most advanced hospitals, per se, to the deployment of health and care resources throughout a large population of patients, recognizing that the lives of all people, whether wealthy or poor, possess equal intrinsic value. In global health, caregivers take the time needed to understand and treat the patient and the context in which that patient lives. In that setting, a real relationship can develop between doctor and patient. In contrast, at a prestigious U.S. medical center, an ophthalmologist is rated based on whether she is able to complete 60 (!) patient visits per day, a schedule that doesn’t allow the caregiver to know the patient, let alone the context. In global health, the patient is front and center. But U.S. caregivers too often find themselves required to spend valuable time responding to insurers’ questions, time that could go to patient care. In global health, crucial determinants of well-being—poverty, unemployment, access to fresh food and clean water—are central to the caregiver’s mission. But in U.S. medical practice, such factors typically fall outside clinicians’ purview. In global health, local people possessing widely varying levels of skill and education—and often lacking even a rudimentary credential—play central roles in delivering care to individuals and promoting the community’s health. But in U.S. medicine, credentials trump all and vast pools of potential talent go unused. More broadly, global-health practice shuns hierarchy in favor of inclusive teams—in sharp contrast to the determinedly hierarchical culture of U.S. hospitals and physician groups. Sprawling academic medical centers are suns around which many patients in the U.S. health system orbit. In global health, few large organizations get between caregivers and patients; care is delivered as close to the patient as possible—certainly in the community, and preferably in the home. 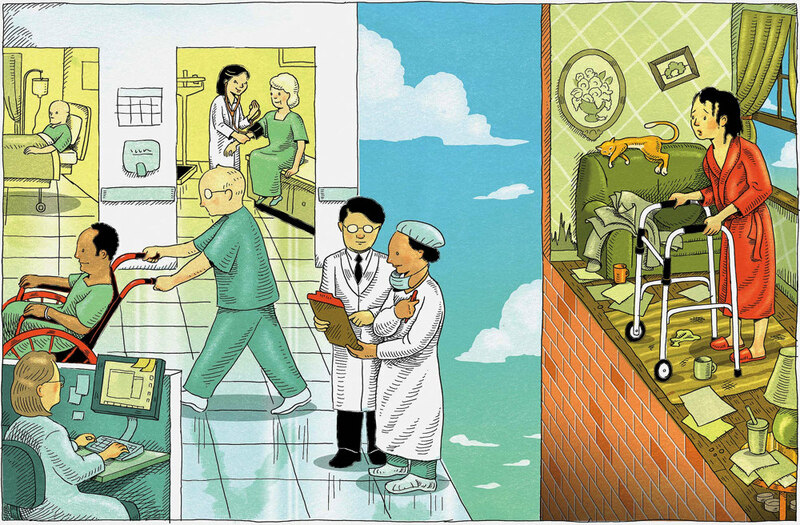 The double meaning of global health at home helps define what we mean: applying global health ideas to care procedures in the United States—and sometimes, literally providing care in the patient’s home. In 1996, physicians from Brigham and Women’s Hospital undertook to treat hundreds of patients in Lima, Peru, who had multiple-drug-resistant tuberculosis (MDR-TB): highly infectious, often lethal, and difficult to treat even under far more favorable conditions. MDR-TB was, in fact, so difficult to treat that the World Health Organization had pretty much given up on being able to stop this epidemic in poor countries. Paul Farmer and Jim Yong Kim (another co-founder of Partners In Health) were able to procure large quantities of medications for these patients, but they faced a difficult challenge: How could they make sure that all of the patients would take a combination of as many as seven medications—each with its own toxic side-effects—every day for as long as two years? Their answer did not—indeed, could not—involve massive and expensive tertiary-care hospitals or highly credentialed academic physicians. The key, they found, was hiring local people to go to patients’ homes daily to make sure they took their pills. These community health workers had little formal education and virtually no training, but they were a low-cost, extremely effective solution: women, recruited from the neighborhood, who knew the area and its culture well, and were able to gain the trust of patients. Through the community workers, Farmer and Kim and their clinical teammates learned about the reality inside patients’ homes, enabling them toaddress needs for food, clean water, and transportation.In this case, an estimated 80 percent of patients were cured, a far higher rate than is typical even in the most advanced developed countries, and the cure came at a tiny fraction of the cost of treating MDR-TB cases in the United States. This approach has also worked in the United States, particularly in disadvantaged settings. For example, consider how Heidi Behforouz, M.D. ’94, who trained at Brigham and Women’s, took on AIDS. In 1997, during her first trip to central Haiti, she found that people with AIDS received care in their homes and were able to sustain a positive level of health and quality of life. But in Boston—the epicenter of the world’s finest health care on the U.S. model—some AIDS patients received no care at all, while others relied upon periodic emergency-room visits when they became really ill.
What made sense, Behforouz thought, was to recruit and train people from the neighborhood to visit the sick, assess their situations, and deliver their medications. These recruits, she says, came to serve as “a bridge between the community and institutions which have become so professionalized and siloed that it’s hard to establish therapeutic relationships.” Those interventions improved health for thousands of people, reduced use of the Brigham and Women’s emergency department, and thus reduced Medicaid costs for these patients by an estimated 35 percent. Better health, lower cost—and a model for the millions of U.S. patients who suffer common, chronic ailments (diabetes, heart failure, hypertension, and asthma) that can also be more effectively, and less expensively, addressed. Global health also came home to the Navajo Nation, 2,300 miles southwest of Boston: one of the reservations that in some ways, even more than the housing projects near the hospital, resemble less economically developed countries—places very far from the fortunate parts of the surrounding United States to which most of the payment-centered medical system caters. For example, Sarah Fatt, a 54-year-old high-school graduate with a certificate as a nursing assistant, is now a community health worker engaged with COPE. She drives her pickup to her patients’ homes in the Fort Defiance area of eastern Arizona, on the New Mexico border. When she arrives to examine 84-year-old Julia M., the first part of the appointment resembles nothing so much as two old chums exchanging stories about family and friends: for the past 10 years, Sarah has helped Julia control her diabetes and hypertension. She measures Julia’s blood-oxygen level and takes her temperature—movements choreographed through years of practice now a natural accompaniment to their conversation. As Sarah reaches for a finger stick, Julia extends her hand. Sarah observes that Julia is lucky to have family support from her son, daughter-in-law, and grandchildren, all of whom live nearby: “With diabetes, the family plays a huge role helping with food choices, taking walks, exercising, making sure she takes her meds.” Through the years, she has educated Julia and her family about diet, exercise, and medication. When Julia was confused about when to take certain medicines, Sarah sketched a drawing of the sun on one bottle to indicate that Julia should take it in the morning. On another, she drew a half sun for midday, and, on a third, she drew the moon. Global health is premised on taking responsibility for all people in a given location—around the world, in the United States, and at all levels of income. A year and a half ago, when Julia fell and broke a hip, the accident marked the first time since she began working with Sarah that she had been to an emergency room—and the only time she was admitted to the hospital. The contrast here is striking: Julia has managed her illness consistently and well, even as people throughout the United States with similar health problems—but whose conditions are not as well controlled—account for billions of dollars in avoidable spending on emergency visits and hospital stays. Global to Local (G2L), a Seattle-area collaborative, demonstrates how these approaches can be applied beyond a single disease, to address community health more broadly. G2L defines its mission as bringing “strategies that have proven effective in developing countries to underserved communities in the United States,” focusing on the diverse SeaTac and Tukwila communities, home to many immigrant families from Myanmar, Eritrea, Somalia, and nations throughout Latin America. G2L identified varied barriers to health: the unavailability of fresh fruits and vegetables, high unemployment, behavioral health challenges, and limited English-language skills. Most of the affected residents have limited formal education and find it difficult to navigate the complex healthcare delivery system. Rather than relying on traditional clinic- or hospital-based care, G2L focuses on using community health workers to understand the health needs in peoples’ homes. It aims to link health to economic development (via public-private partnerships) and to integrate public health and primary care delivered in clinics. As an example, G2L focused on assisting diabetes patients by using smartphone-based applications: a simple but effective intervention to help them track diet, exercise, and blood sugars. The program also connected patients with student volunteers from the University of Washington who sent them text-message reminders to take their medications as well as notes of encouragement. This low-cost program, requiring no physician or nurse time, yielded a significant improvement in enrolled patients’ health. “The patients felt accountable to someone who cared about them,” reports Adam Taylor, who directs the program. He says the students, who received some basic training, proved to be quite reliable and skilled in their dealings with patients. The students also helped 7,000 people in the community complete the often-confusing work necessary to sign up for insurance under the Affordable Care Act—one way to address broader public-health issues. Can a global-health approach also make a transformative difference among the tens of millions of well-educated, upper-income Americans, who commonly have access to insurance and higher-quality care? Encouraging news on this front comes from the Pacific Business Group on Health (PBGH), a collaborative of large employers and government agencies based in California who use their insurance-purchasing clout to improve quality and affordability. PBGH’s “intensive outpatient care program” has focused on patients with multiple, complex chronic conditions who are frequent users of high-cost emergency-room visits and in-patient hospital stays. In the initial phase of the program, care coordinators visited 15,000 patients in 23 delivery systems in the western United States, seeking to establish trusting relationships with them. As this program continues, the idea is to have care coordinators visit patients in their homes and collaborate with the patients’ primary-care physicians—providing medical care and addressing other needs (transportation, food) that have a direct bearing on health and quality of life. This integrated approach has resulted in significant improvements in both areas—and reduced emergency-room and in-patient stays. PBGH’s intensive outpatient care program has proven effective with large populations of well-educated, middle- and upper-income individuals. When tested among employees at Boeing suffering from a variety of medical conditions, hospital admissions decreased 28 percent. A similar approach with employees of the Pacific Gas and Electric Company and the California Public Employees’ Retirement System has demonstrated that the intensive approach not only improves health and well-being but has also reduced claims costs by as much as 20 percent. Whether in Haiti or in California, these successful approaches to improving care all build upon caregivers who establish relationships with patients, go to their homes, and factor in broad determinants of health: all the approaches are, ultimately, patient-centered. This care matrix can work in any setting, and can address the most pressing needs in the U.S. healthcare system: to improve the health and well-being of millions of Americans, at any income level, more effectively and efficiently. Global health improvements can work for the huge populations plagued by the kind of multiple, complex, chronic conditions that are epidemic in the United States. What will be required to bring global health home to cure American health care? The obstacles are significant: tradition, culture, and regulations inhibit the kind of nimble innovation characteristic of the best global-health practices. Most doctors and caregivers aren’t familiar with the strategies and services we describe. But the timing is favorable for change. As generally rational economic actors, hospitals and physician groups do what they are paid to do. Under fee-for-service reimbursement, these actors have been paid for the volume of care they provide, rather than for its quality and outcome, producing well-documented overuse of clinical services. Global health seeks health as the outcome, not the volume of reimbursable services. Global health-driven innovations can also help the U.S. system absorb 20 million newly insured Americans. Because the Affordable Care Act prevents insurers from turning down people with pre-existing conditions, many of those recently enrolled are struggling with a variety of ailments. The global-health ethos of doing more with less, extending the care team to include community workers, and ministering to people in their homes as a way to improve their overall health, all align with current national needs. Donald Berwick ’68, M.P.P.-M.D. ’72, former administrator of the Centers for Medicare and Medicaid Services, puts it this way: “We have to change the mentality of what excellence looks like. Excellence is not the gleaming new machine; it is someone who knows you and can help you access the resources and care you need from people you know.” What he is talking about is global health; it is time to bring these improvements home to health care in the United States. Howard Hiatt ’46, M.D. ’48, associate chief and co-founder of the division of global health equity, Brigham and Women’s Hospital, served as dean of the Harvard School of Public Health for 12 years, and has been a member of the boards of Physicians for Human Rights, the Institute for Health Care Improvement, and Partners In Health. Charles Kenney, an executive at Northwell Health in New York, is the author of The Best Practice: How the New Quality Movement Is Transforming Medicine and Transforming Health Care. Mark Rosenberg ’67, M.D. ’71, M.P.P. ’72, worked for the Centers for Disease Control for 20 years and established the National Center for Injury Prevention and Control there; he is president and CEO of the Task Force for Global Health. The authors are working with the Institute for Health Care Improvement, Partners In Health, Global to Local, and other partners to build a sustained initiative to apply components of global health at home within the United States.